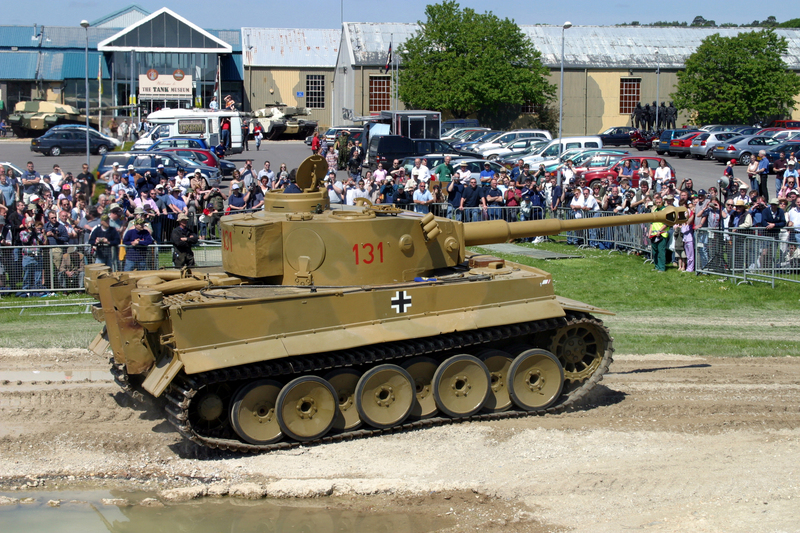 Tiger 131 was restored to running condition in the early 1990s. This involved replacing many parts, most significantly the engine. 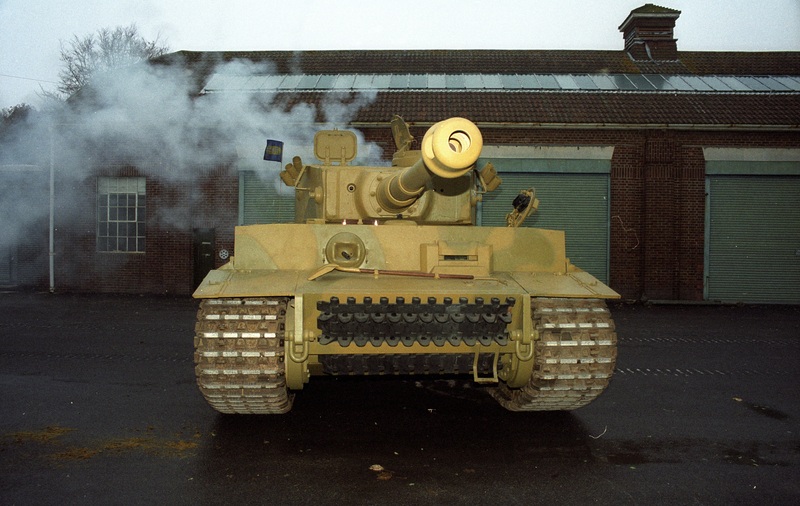 However these weren’t the first of Tiger 131’s components to be replaced by British technicians. Shortly after its capture, the original hatch is still fitted. 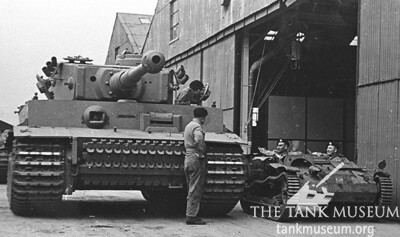 When Tiger 131 was captured in late April 1943 it was almost complete. 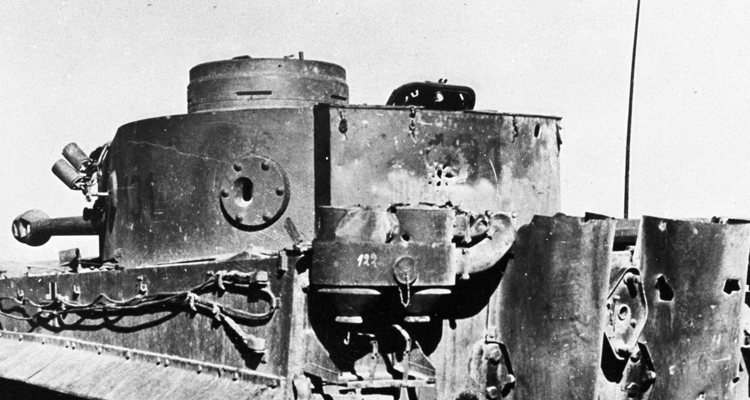 However the tank had sustained damage during the fighting which led to it being abandoned. Whilst some of this is still visible, more was repaired fairly soon afterwards. One round impacted near the driver’s hatch on the left of the hull roof. This did fairly extensive internal damage, including smashing the radios, fitted between the driver and radio operator. On the 7th May 104 Army Tank Workshop, REME under the command of Major Douglas Lidderdale recovered Tiger 131 from the battlefield. As Tiger 131 was the first example of this new, powerful German weapon to be captured in anything like intact condition its intelligence value was huge. The British were keen to learn as much as they could, so 104 Tank Workshop restored it to running order over the next week. On the 14th May a recognition film was made. On the 18th June 1943 King George VI crouches next to the new, incorrect hatch. 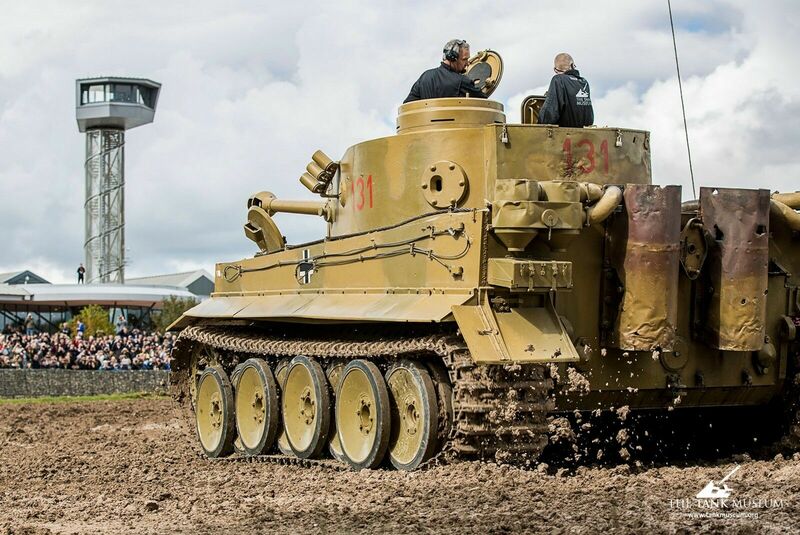 After this Tiger 131 received more maintenance and attention from Lidderdale’s men. They were assisted by the fact that as the Germans had surrendered, their equipment was now in Allied hands. 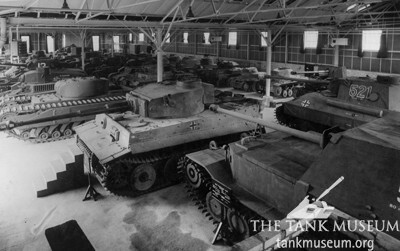 The Maintenance Workshop of German Heavy Tank Battalion 504 was a plentiful source of spare parts for the tank. 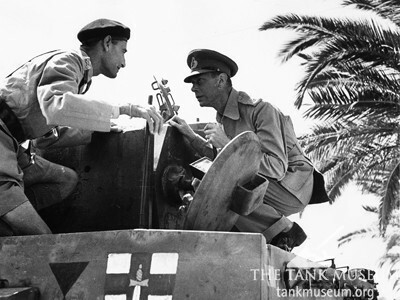 By the time Winston Churchill inspected Tiger 131 in Tunis on the 2nd June, the driver’s hatch had been replaced. The 1st Army shield was painted just below it during this period, giving us a useful dating reference. The recognition film and photographs of Churchill’s visit allow us to date the hatch replacement to this three week period. We can be this certain because the replacement hatch wasn’t a driver’s hatch at all – it was a radio operator’s. As these were normally fitted on the right, the soldiers at 104 Army Tank Workshop had to mount it back to front. The giveaway is the periscope cover in the hatch roof. It should be at the front of the driver’s hatch, not the rear. Why replace the driver’s hatch? At Chobham, still with the wrong hatch. We don’t know why the hatch was replaced. 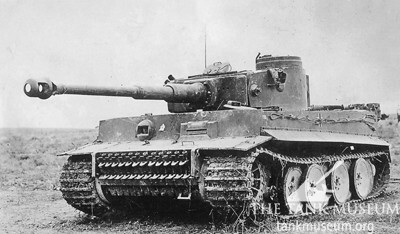 Photographs of Tiger 131 taken shortly after its capture don’t show any obvious damage to it. A good reason to replace it would have been if it was inoperable, but it can be seen closed, ajar and open in these early photos and the recognition film, suggesting this wasn’t the case. Whatever the reason, Tiger 131 sported this replacement hatch for much longer than it had the original. Still at Chobham, a driver’s hatch has now been fitted. 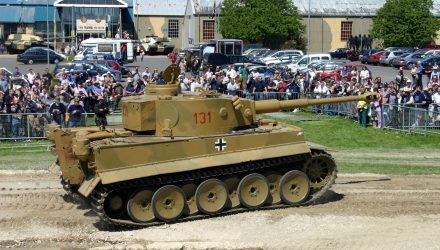 Later in 1943 Tiger 131 was taken to the UK for evaluation at the Gunnery School in Lulworth and then the School of Tank Technology at Chobham. Eventually the hatch was replaced with a driver’s hatch. We believe this happened at some point in the late 1940s or early 1950s, before the vehicle was donated to the Tank Museum in 1951. One photograph from Chobham shows Tiger 131 with the radio operator’s hatch, but in another it’s been replaced. Unfortunately neither can be dated. For a museum object, the question of originality is important because of the historical information it supplies. 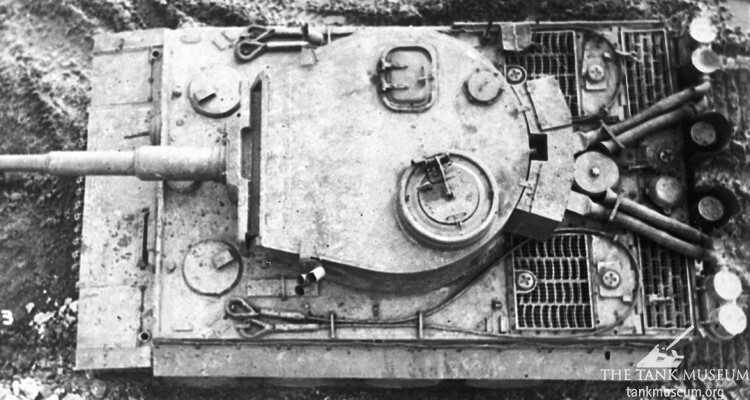 The story of Tiger 131’s driver’s hatch shows how this question can arise in practical terms. Is the current hatch original? It isn’t the hatch fitted at the factory, but it is an authentic German component. It was fitted by the British post-war, but it could plausibly have been installed by German repair crews had Tiger 131 not been captured. Does this make a difference? These questions don’t necessarily have right or wrong answers, and this debate is ongoing across the museum sector. Find out about the capture of the Tiger and the restoration process. Read more about Tiger tanks, as well as the history of tanks from their conception onwards, in the books below. Show your love of German armour with an inflatable 88mm shell. The photo of the Chobham shed raises a question, I think the Panzerjäger Tiger (P) Sd. Kfz. 184, looks like a wooden mock-up, did Chobham have a fleet of dummy Panzers during WW2? The design of these hatches was changed at an early stage; three submersion latches were deleted. Therefore it’s important to note that this hatch is not the original. In fact, if the new hatch was obtained in England it probably came from a Mid Tiger that was destructively tested there.